The Tayra was a star on the Mono Precioso Camera last fall. The Mono Precioso camera is a Bushnell Trophy cam. It was set to take 3 images per trigger. It was placed near what I though was a good animal trail. It was at the bottom of the mountain where the terrain began to flatten. There are permanent water sources nearby as well as a pasture and plenty of tall trees. There is a chance that this camera recorded the biggest variety of animals of all of the cameras that we used. We also were able to record some rare predation activity and an extremely rare aquatic mammal. Capuchin monkeys are mostly up in the trees, but they do come to the ground(but still on a tree). The Mono Precioso camera trap caught the monkeys very near the ground on three separate occasions. However, the 9/15 visit shows what is perhaps a pair that is taking a look around. The weasel-like Tayra seemed fond of this trail. We assume that it was a male as best we could tell from the photos. He seemed most active in the mornings. The Tayra is an omnivore, eating fruits, insects, nuts, birds eggs, reptiles, and small mammals. While reptiles are common at Ocho Verde, we rarely see them on the trail cameras. The Mono Precioso camera was able to spot this male iguana(orange head). It was probably heading out to the pasture edges to sun itself. Unfortunately, Iguanas and Tayras don't get along so well together. On October first, the Tayra crosses the camera at 8:26 am. Six short minutes later, it returns again with the iguana in it's maw. 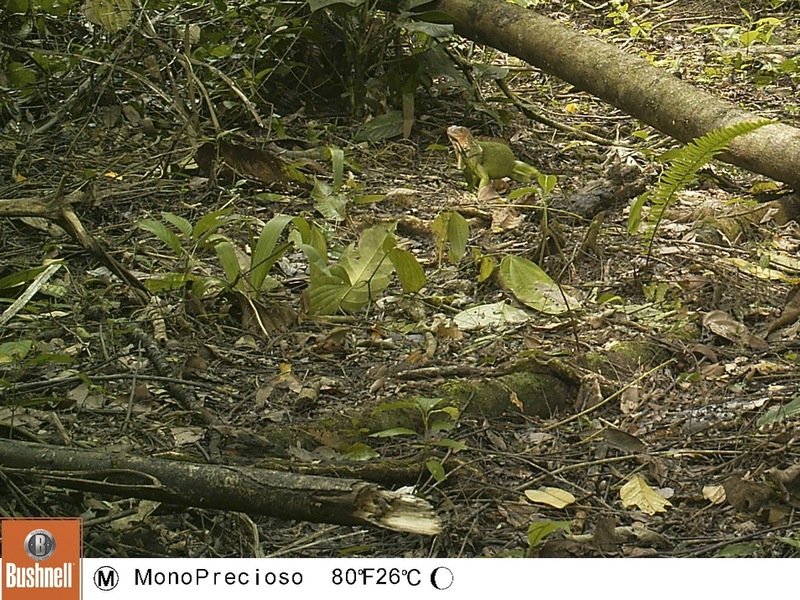 In addition to the tayra and a few ocelots, the Mono Precioso camera also caught the Neotropical River Otter. This site is 150-200 meters from the permanent water source. We only saw the otter on one day, and we felt fortunate that our water source is pristine enough for these neat animals. We have also rendered a few videos from the Mono Prcioso camera. As always, maximize the screen size for better viewing. The first video involves the Tayra. The Second video is a compilation of nearly all images from July thru January set at a fast pace. Definitely need a max screen size for this one. You can keep up with nearly all the camera trap updates by subscribing to this blog and see all the videos plus some others on the Ocho Verde Youtube Channel. If you like Twitter, we often announce updates to the blog and videos through tweets.